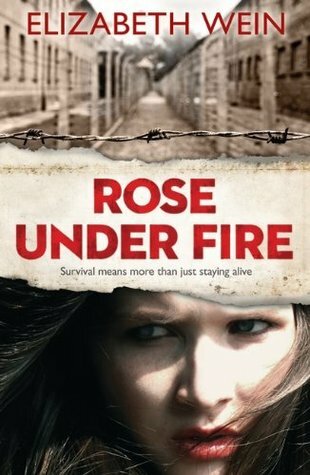 Rose Under Fire throws you into a much more harrowing and isolated world of a women's concentration camp at the tail end of World War II. Rose Justice's story is an amalgamation of many from the camps and the narrative follows her brief time in England before being captured flying over Europe and sent on to Ravensbruck. Wein holds nothing back in her vivid descriptors of the camp. It's uncomfortable reading and so utterly hopeless at times, but more often that not Rose's narrative simply makes you feel angry. There are no spoilers really, these women's stories were real and some of the women listed were actually held at the Ravensbruck camps in World War II. I've seen a lot of comparisons between Code Name Verity and 'Rose', but in my opinion to bundle the two together would do both novels a disservice. Though there are some characters interlinked between the novels, these are two very different stories told from the point of view of two very different women. What is common with both novels is the power of female friendships and relationships. The bond of sisterhood is boiled down to it rawest form in 'Rose'. The situation in the Ravensbruck women's camp is sad, it's desperate and it's deeply upsetting but despite this Wein has weaved so much humanity in the narrative. There's hope and friendship despite disgustingly inhumane circumstances. Many of the characters are broken both physically and mentally but that makes her feel all the more real. Rose's fellow captives, Elodie, Karolina, Irina, Roza, Lisette and Anna are all capable women who remain defiant and brave despite the odds and that's so, so wonderful to read in a YA novel. Rose herself is an incredibly resilient character and her undeniable American fighter pilot spirit and soldier mentality courses through her accounts of her time as Ravensbruck, and yet Wein allows her so many moment of vulnerability to grieve, allows her guilt to pour out, and allows her PTSD to be laid bare on the page. Ultimately the word I keep coming back to when I try and describe this book is powerful. The story itself hits home hard, as a historical war novel the story really doesn't have a happy ending. But as the blurb states Rose's story is one of 'courage in the face of adversity' and the power of the story truly lies in the hope and bravery demonstrated by Rose and her friends.